McBASTARD'S MAUSOLEUM: Step into a serial killer’s twisted world when the dark crime thriller, 'Hangman', arrives on Blu-ray™ (plus Digital), DVD, and Digital February 27th from Lionsgate. 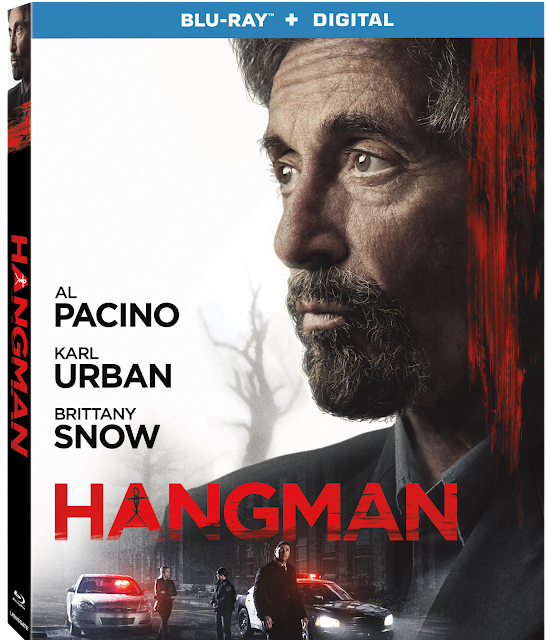 Step into a serial killer’s twisted world when the dark crime thriller, 'Hangman', arrives on Blu-ray™ (plus Digital), DVD, and Digital February 27th from Lionsgate. Step into a serial killer’s twisted world when the dark crime thriller, Hangman, arrives on Blu-ray™ (plus Digital), DVD, and Digital February 27 from Lionsgate. The film is currently available On Demand. Academy Award® winner Al Pacino (Best Actor, Scent of a Woman, 1992) stars as a homicide detective on the hunt to catch a psychotic and ruthless serial killer who is playing a deadly version of the hangman game. The film’s all-star cast also includes Karl Urban and Brittany Snow. From the producer of Live Free or Die Hard and Lord of War, director Johnny Martin, and writers Michael Caissie and Charles Huttinger, the Hangman Blu-ray and DVD includes two insightful featurettes and will be available for the suggested retail price of $21.99 and $19.98, respectively. Decorated homicide detective Ray Archer (Al Pacino) partners with criminal profiler Will Ruiney (Karl Urban) to catch one of the city's notoriously vicious serial killers, who is playing a twisted version of the child’s game hangman, while journalist Christi Davies (Brittany Snow) reports on the crime spree, shadowing the detectives. Title Copyright: © 2017 Hangman Productions LLC. All Rights Reserved.